Air Duct Cleaning Services. Free Estimates. 24/7 Service. At DryAgain Water, Mold and Fire Restoration Services, we understand the importance of keeping your environment clean and free of health hazards. Maintaining clean air ducts in your home or business provides a cleaner living and working environment. Clean, well-maintained air ducts dramatically reduce dust and other airborne debris, ensuring that the air that circulates through your property is free of airborne hazards that can trigger asthma, allergies, and other health-related issues. Keeping clean air ducts also increases the efficiency of your heating and cooling systems, which increases both the life of your equipment, and the money you save over time. Air ducts run through walls, underneath the floors, and even in ceilings. Because they are exposed and connected to every part of your property, they are at the highest risk of becoming contaminated by mold infestation after a flood or other water saturation event. In the event of a fire, smoke, soot, and ash are carried through the ducts, lodging there and polluting rooms that were unaffected by the initial incident—not to mention stinking up the place. A dirty air duct carries dirty air—it’s that simple—and dirty, contaminated air causes all sorts of problems for your property, and the people who live and work within it. The National Air Duct Cleaners Association recommends regular cleaning of your air ducts to improve indoor air quality and promote energy efficiency when heating or cooling your home or office. In a typical six-room home, everyday living activities can generate up to forty pounds of dust annually. This figure can be adjusted upward when considering other factors like the presence of smoking or other dust creating activities like construction or remodeling. Through normal occupation of a home or business, we generate a great deal of air pollutants and contaminants. Dander, dust, pollen, mold spores, and chemical residue are all pulled into your HVAC (heating, ventilation, and air conditioning) systems and re-circulated between 5 and 7 times every day. Over time, these contaminants build up and begin to clog your ductwork. At DryAgain Water, Mold and Fire Restoration Services we know that the air ducts are your property’s lungs, pulling air in and out of your immediate environment every day. Dirty ducts lead to inefficient air circulation, leading to a stuffy unpleasant environment for everyone. Regular cleaning of your HVAC system helps you to save money, as well as improving air quality. If any part of your home or business has been affected by water damage, there’s a good chance you should have your air ducts checked. Following a flood, or any event that leads to saturation within your property, the follow-up concern is mold. Mold colonies like to form anywhere the humidity has reached above 45%, and mold spores are airborne. That means that mold spores can use your HVAC system as both transport and a nice dark place to start a home. Mold is nature’s recycling system, breaking down organic matter into its component parts. It is inescapable, and whether we realize it or not, we come in contact with mold every day. Unfortunately, indoor mold is bad news. Mold can spread through your air ducts into rooms that were unaffected by the initial water-related event, which makes for a property-wide issue that is very difficult to remove without help from the professionals at DryAgain Water, Mold and Fire Restoration Services. Once mold has contaminated your HVAC system, it is imperative that you call DryAgain Water, Mold and Fire Restoration Services to help. We possess the best tools for the job, enabling our team of experts to access even the most hidden and difficult places. Air ducts run through walls, and the spaces between your walls are a prime breeding ground for mold, fungi, and even harmful bacteria, which can then be introduced into your air supply. Symptoms of mold contamination include itchy, watery eyes, congestion, skin irritation, difficulty breathing, sneezing, and general discomfort. The elderly, children, pets and those with allergies or asthma are particularly susceptible to the hazards of dirty air ducts, but the health of everyone who spends time on the property can be put at risk. There is no reason to wait, call DryAgain Water, Mold and Fire Restoration Services today and get your free estimate. Fire damage can be devastating enough, but the problems that follow a blaze on your property can multiply in the days that follow. Smoke and soot can travel into your ductwork, lingering there and creating an unpleasant odor everywhere in your home or business. Moreover, that soot and smoke can clog vents and ducts, and circulate into the rest of your property. Following the event of a fire, it is recommended to shut your HVAC system down to prevent further contamination, but smoky sooty air can circulate through your ductwork even when no powered motor is present. Furthermore, our trained team will be able to determine whether the fire breached the duct itself or was generated in some other location that might not be readily accessible. At DryAgain Water, Mold and Fire Restoration Services we know that the regular cleaning and maintenance of your air ducts is vital, not only for your health and energy efficiency, but because a clogged and dirty air duct can sometimes present a fire hazard. There is no job that is too big or too small for the experts at DryAgain Water, Mold and Fire Restoration Services. Our service professionals are all highly trained, continually educated, and licensed—including IICRC certification. That means that we have made the investment in our team, our equipment, and in the future of your home or business. 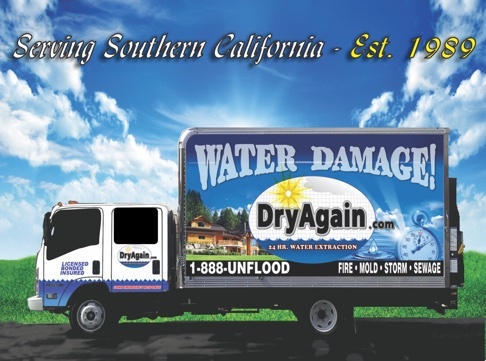 At DryAgain Water, Mold and Fire Restoration Services we have combined decades of experience dealing with many different types of restoration, water damage and more, and we know how they can combine to make a seemingly hopeless task of clean up and restoration. Leave it to us. We can even work together with your insurance adjustors to reduce your out-of-pocket costs, whatever the circumstances. The best advice we have for you is: don’t wait! The severity of the problem can increase hourly, and every wasted moment risks the value of your property.